You know those lazy weekend days where its dark and gloomy outside and the morning just calls for a big stack of pancakes? This wasnt one of those days. It was a gorgeous day out and I had a whole day planned but all I wanted to do was stuff my face with pancakes. Im classy like that apparently. I had these banana pancakes bookmarked for a couple of months because they use ingredients that I always have at home, especially a dark spotted banana. I like them green and if theres even one brown spot on it, I cant eat it. That means lots of pancakes will be coming my way which is good since these pancakes are fluffy and tasty, and surprisingly not full of butter. I used regular flour, but next time Im going to try whole wheat flour. To be Healthy. Note: The amount of syrup in this picture is scant. I obviously use much more. In a separate bowl, whisk together mashed banana, milk, eggs, and vanilla until thoroughly combined. Using a wooden spoon, fold wet mixture into dry ingredients until just combined. The batter will be slightly lumpy. Preheat you frying pan or griddle to medium high heat and coat with butter or coking spray. Using a 1/3 measuring cup, scoop batter onto the griddle. Cook until a few holes form on top of each pancake and the underside is golden brown, about 2 minutes and then flip and cook the pancakes for another 2 minutes. Serve with sliced banana, walnut halves and maple syrup. The holiday weekend has come to an end as has the family bonanza. Its a nice time of year where you get to see family and friends from out of town and enjoy good meals and you get time off work. Alas, on my final day off I woke up with a sore throat and fever! Guess that leaves me sitting on the couch and watching Game of Thrones. Tee hee hee. While this weekend was filled with brisket and matzah ball soup, last week I baked some tasty scones. I ate one and was about to have another when I decided they were safer at my neighbors. Unbeknownst to me, it was the college basketball championshipwhats that called? NCAA or something? I dunno! All I know is, I brought them to my neighbors, there were a bunch of boys there and they all enjoyed these scones. 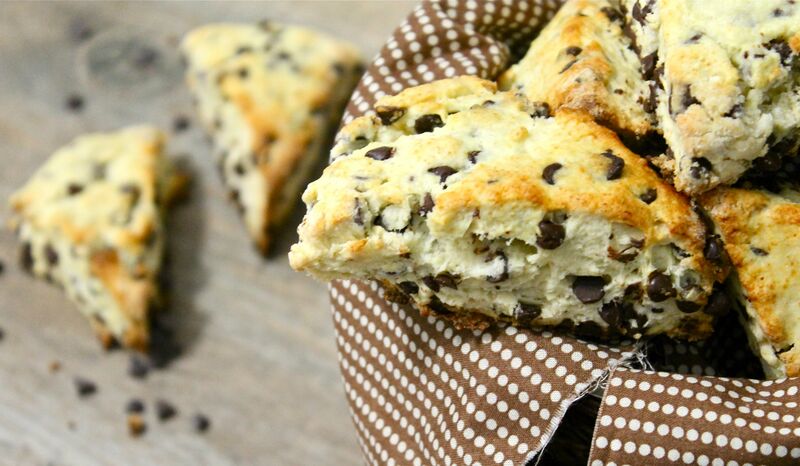 So ladies, these are a winnerbut maybe dont disrupt a beer drinking basketball party with scones it looks weird. I would suggest serving these for breakfast, or for a brunch. They come together quickly and take no time at all to bake. 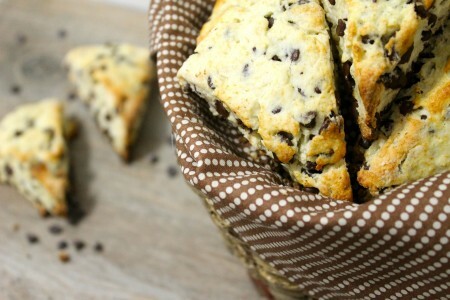 Best of all, they are moist unlike most other scones Ive tried. They really are a winner, and I plan on making them again this time with different additionsmaybe blueberries? Oh. And. Winter is coming. Beat together the milk and egg and set aside. In a large bowl, whisk flour, baking powder, and salt. Rub butter into the flour mixture with your hands. Working until you have no lumps bigger than a pea. Add the sugar and chocolate chips. Stir to mix. Take a scant 1/4 cup of the milk/egg mixture and set aside to be used for a glaze. Whisk the vanilla into the remaining milk/egg mixture and add to the dry ingredients. Bring dough together gently with a wooden spoon. Turn dough out onto a lightly floured surface and knead it no more than 12 times. Pat dough into a round approximately 1/2 inch thick, and cut into 8 (or 12) wedges. Place on an ungreased lined baking sheet. Using a pastry brush, glaze wedges with remaining milk/egg mixture. Bake for 10-15 minutes, or until golden. Cool on a rack. Can serve with a light dusting of powdered sugar. Happy holidays! Hope you enjoy the scones! !